I overheat easily, and have some chronic sinus issues, so needless to say, I checked out the Dyson Pure Cool immediately. The Pure Cool, as you can probably guess, is a combination fan and air purifier. It is not a portable air conditioner, though the air does come out very cool, and unlike some previous Dyson products, it doesn’t do triple duty as a space heater. Dyson fans (get it?) will love the design of this thing, from the bladeless fan to the quiet operation to the beautiful screen that’s easily legible from across the room and fully dimmable. The included remote is fine, but the app and Alexa are better. Also, the Iron/Blue colorway is awesome. The fan has ten speeds, with everything under the five setting being pretty negligible noise-wise, and it can also oscillate at whatever angle makes sense for your room. If for some reason you want the clean air and not the accompanying breeze (you monster), the “backward airflow” mode will send the Pure Cool’s output backward and upward. Air purifiers are not cheap, nor are they a product you want to skimp on. 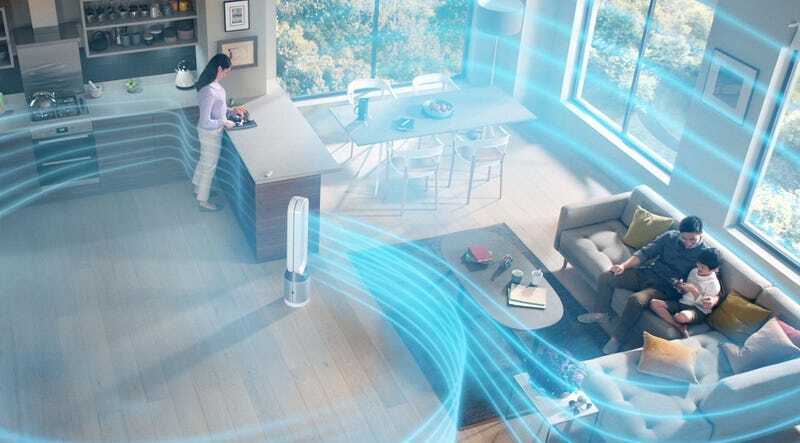 You can definitely find cheaper, great air purifiers and cheaper standalone fans, but the comfort you take in Dyson’s filter technology and the comfort you get from the Pure Cool’s breeze, plus the space you’ll save by combining appliances are worth the price of admission here.